Urban Synergy in Action is a new project in Bridgeport focused on boosting the city’s black and Hispanic business community. It was created by Bridgeport resident Kim Bianca Williams, who currently runs her own business consulting firm, VCL Consulting Group, Inc. Her goal is to expand the operation into a four-unit incubator-style business for people of color looking to turn their ideas into a business. 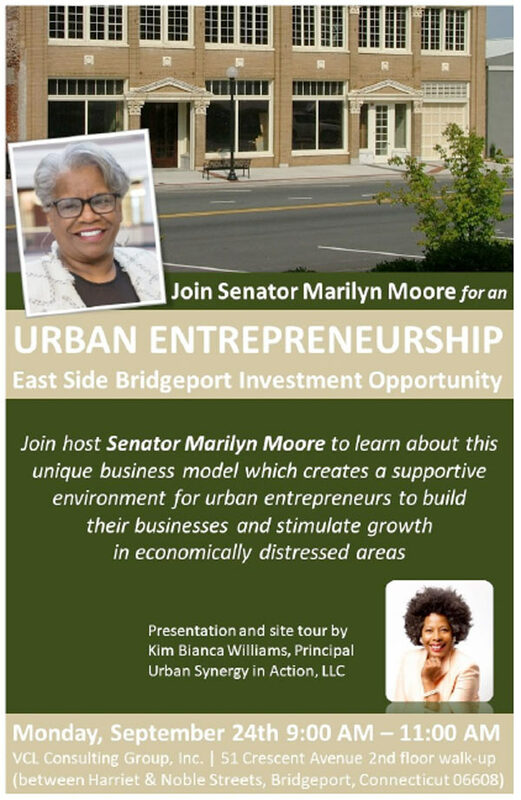 I’m inviting anyone who is interested in learning more about the project to an Urban Entrepreneurship Information Session on Monday, September 24th from 9 a.m to 11 a.m. at VCL Consulting Group, Inc., 51 Crescent Ave., Bridgeport. Learn more about the project on the Connecticut Post and by watching this informational video.